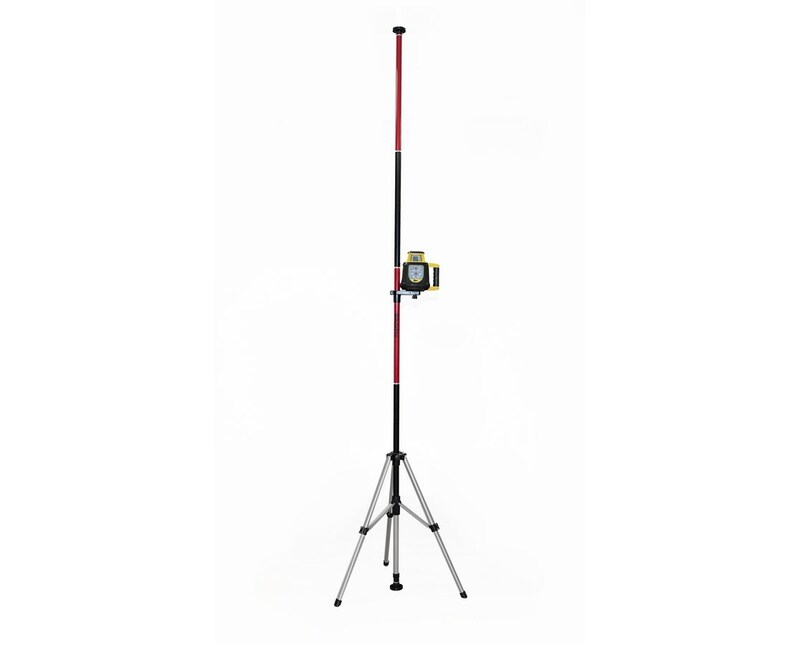 AdirPro’s Telescoping Laser Pole with Tripod and Mount is the perfect accessory kit for heavy duty lasers. Practical in its design, the telescoping laser pole is a 3-in-one tool. 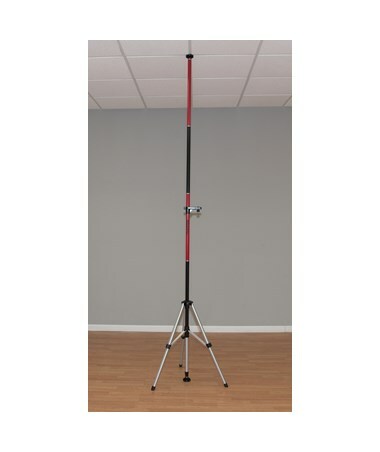 It’s a multifunction pole with a tripod and a multipurpose mounting bracket. It all comes in a neat 3 section carrying bag. The carrying bag is soft and durable, with a reinforced carrying strap. Each section has a zipper closure and is sized to fit the coordinating items. There’s one pocket for the poles, one for the tripod, and one for the mount. The entire package is backed by AdirPro’s standard limited lifetime warranty. The pole of the 790-77 kit comes with 5 sections and 2 rubber plated end pieces. It is made of aluminum and has a polyurethane black and light brown coating. The graduations are marked in white at half inches, inches and feet. The pole has a diameter of 1.24”. The main section of the pole can be used at a minimum of 31” (including the bottom end piece). It can telescope out another 22 ½” (a total of 53 ½”). Each additional section adds 2 feet of height clearly marked with one foot having a black coating and the other a light brown coating. When fully assembled with all five sections and both end pieces, the pole stands at 151” (12’7”). Each end piece is made from heavy duty plastic for extra durability. It also has a slightly raised rubber plate covering most of the diameter of the piece for slip resistance. 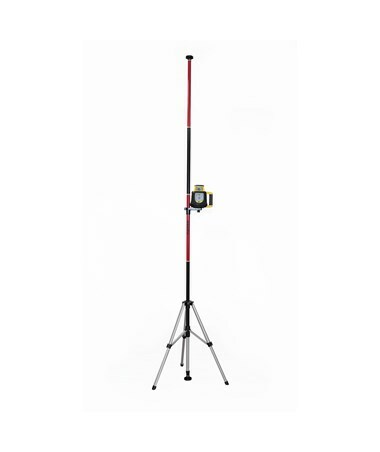 The tripod of this laser pole kit is made of standard aluminum with heavy duty plastic joints, and ribbed rubber feet. The length of each retracted is 18.5” and telescopes up to 32”. This gives the tripod a height from a minimum of 16” to a maximum of 27.25”. The telescoping mechanism is locked with heavy duty plastic pressure clamps. They are easy to use and adjust. The head of the tripod is open to fit the coordinating pole with a diameter of 1.24” (as is the senter joint of the tripod inner support). There is a screw clamp on the side of the head to stabilize the pole and lock it in place so that it won’t shift. Additionally, there is a small bubble level embedded in the head so that you can be sure that the tripod is leveled. This will ensure that your measurements will be as accurate as possible. Made of heavy duty plastic, the mounting bracket that comes with the extended pole and tripod kit is sturdy and durable. The platform of the bracket is 6.25” x 4” x 7/8”. The total dimensions of the product are 6.25” x 5.375” x 2.5”. These dimensions include the widest part of the bracket and the height of the socket for the pole. The socket for the pole snugly fits the accompanying pole (1.24” in diameter). The pole is secured in place with a simple, easy-to-use pressure lever. The mounting screw has a 5/8” and a 1/4" thread to accommodate standard nuts on most instrument units. The screw can be adjusted within 1.25” in depth. This allows the mount to be used with any instrument that is anywhere from 1.5”-2.625” from the back of the instrument.